Y5/6 Sports Hall Athletics team finish in Silver medal position! Amie Gregson and Tom Foster from Year 6, were selected to attend training for this award at Accrington Academy on November 10th. The training helps them promote sport in our school and be role models to other children. 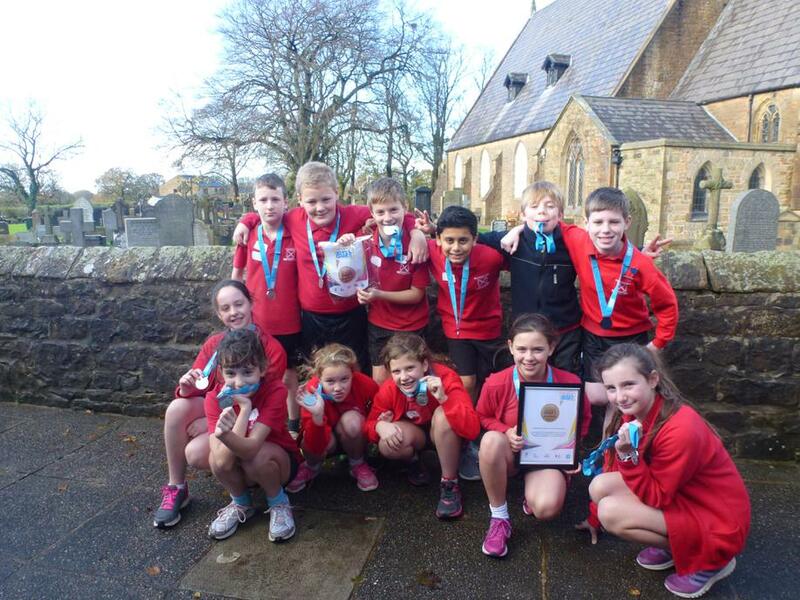 School Sporthall Athletics (Y3/4): Thursday 19th November 1 - 3pm at Hyndburn Sports Centre. A fun afternoon of indoor athletics. Well done to our Y3/4 children who all joined in enthusiastically. Many thanks to the parents who helped with transport and to Mrs Riddell for her support. School Sportshall Athletics (Y5/6): Wednesday 18th November 1 - 3pm at Hyndburn Sports Centre. Congratulations to the team. The came SECOND in the Ribble Valey small schools competition and were awarded with SILVER MEDALS. All the children took part in 2 track events and 2 field events. The combined scores of the girls' and bots' teams went towards the final results - so everyone contributed towards our silver medal position. Well done! An excellent result and more success for our girls in sport. Mellor didn't get a chance to get into the game and by half time we were well ahead. It's great to see the girls moving into space, and passing the ball with speed and confidence. Well done girls! Football: Thursday 22nd October 3:30 at school. Friendly V Mellor. A very close game in hich we took the lead with a first half goal from Raees. Mellor drew level before the break, and scored again towards the end of the game. This was a great effort from our boys as we were playing a Year 6 Mellor team. we had two from Y6, three from Y5 and three from Y4. well done to all of them, but particularly those younger boys. Many thanks to Mr Holroyd for being the match referee. We played in a mini league against Oakhill, Simonstone and St James'. We won 2 games, drew 1 and lost 1. Ariz scored 4 goals. We just missed out on qualifying for the quarter finals. A very good effort from everyone. Thanks to all parents who helped with transport. Once again, our girls had a fantastic afternoon. A great run from Kate to finish FIRST in the girls race. A brilliant result, particularly as Kate is in Year 5 and many of the other runners were in Year 6. She was followed by Amie (11th), Kaitlin (15th) and Isabella (30th). THeir combined scores placed us SECOND out of 16 schools from the Ribble Valley in the team event. It is the first time we have had a team on the podium at this competition. Well done to Charlotte who improves with every run, and Tilly who ran for the school for the first time. Sam (27th) and Tom (31st) finished well up the field in the boys race, and Raees and William also put in good performances. THanks very much to all parents who supported and helped us on the day. An amazing performance from our girls'team. Kate (4th), Amie (14th), Kaitlin (15th) and Isabella (24th) counted towards the team event finishing with our best ever team score of 57 points. 4 great runs. Well done also to Charlotte who put in a strong perfromance. Congratulations to Erin, William and Matthew who were all running for the school for the first time. There were very solid runs from Sam (32nd) and Tom (40th) in a race of over 120 boys.